The Cormorants Swimming Club had its beginnings in St Columb Major in 1968 as an additional attraction for the local carnival week. The Carnival Committee sought to introduce some water sports into the Carnival week and to use the pool which had just been built at Trewan Hall. One swimmer amongst their members was John Dawes and it was a result of his interest and efforts that the Club came into being. Interest spread rapidly and the demand for all year round swimming resulted in the Cormorants being forced to travel outside of Newquay to be able to offer its members swimming. They moved around from Trewan Hall to the Apollo at Perranporth (now Perran Sands), the Bay Hotel in Newquay, Bodmin Pool, and the then new pool at Polkyth St. Austell. In 1975 the Newquay Swimming Pool was opened and a permanent home for training finally secured. Also in this year the Club became County Champions for the first time and in 1977 won the Restormel Cup. Cormorants have continued to use the pool at Newquay since this date and now work in a successful partnership with Newquay Waterworld to offer the “swim time” needed by all its members at their appropriate level in the 25 metre, 6 lane pool. The Club also uses the 20 metre pool at Newquay View Resort for additional training sessions. 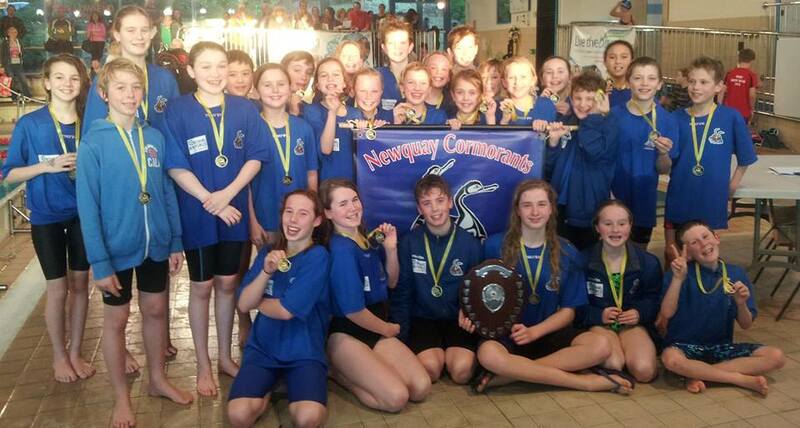 As a modern swimming club Cormorants’ swimmers represent the club across a wide variety of competitions and swimmers who qualify for events are supported by the club at the County, Regional & National Age Groups and Youth Championships. Cormorants offer opportunities to compete at open meets as well as inter-club galas and our own Club Championships. In 2014 Cormorants’ talented young swimmers (pictured below) won the County Division 2 Sheild securing promotion to Division 1. Cormorants are rightly proud of their history and have helped to develop swimmers at all levels who have gone on to compete at county level all the way through to international competitions. Cormorants strive to put the well-being and development of its swimmers first and is one of the most respected swimming clubs in the County. If you would like to join this friendly, local club please contact the Club secretary Gemma Farhall on 07814 733868.